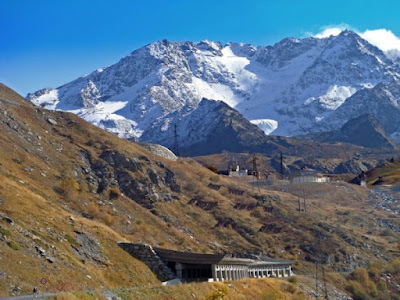 Val Thorens is located in the Tarentaise Valley in the commune of Saint-Martin-de-Belleville of the Savoie département. It is the highest ski resort in Europe, at 2300 m altitude forming part of the 3 vallées linked ski area. The cycle up to Val Thorens is one of the longest and biggest climbs in France. With several towns along the route – there is light but fast traffic on the first half of the route. After Saint-Martin it gets much quieter and the scenery ever more savage as you can see above.